This credit and debit card provider doesn't need any further introduction as its financial services are well known all over the world. If you already own a MasterCard, then you know exactly how easy it is to use for various offline and online payments. Thanks to their great services and a well-thought marketing plan, MasterCard is among the most-used cards globally. Moreover, using MasterCard has the potential of dramatically improving your experience with various online betting sites. In case you didn't know this already, MasterCard is one of the most popular payment options used by punters across the world for placing bets at the biggest betting sites. In this article, you will get valuable information on the top MasterCard betting sites as well as an in-depth look at how MasterCard works. We’ve prepared a thorough review as well as a couple of step-by-step guides for you. Enjoying such a huge success worldwide, it was predictable that MasterCard would be picked up by the biggest betting sites in the UK. One by one, all the major sportsbooks implemented this payment method as one of their top recommendations. Today, MasterCard is one of the most-used payment options for betting activities. The betting sites that you’re going to read about in the following section have tens of years of experience in the field and enjoy an unshakable reputation both in the UK as well as the rest of the world. William Hill has its special place on the UK betting scene. With a massive presence both in the online environment as well as hundreds of shops all across the country, William Hill is undeniably one of the giants. When a betting site the size of William Hill with a massive customer base recommends you as a top payment method, you know you’re doing things right. 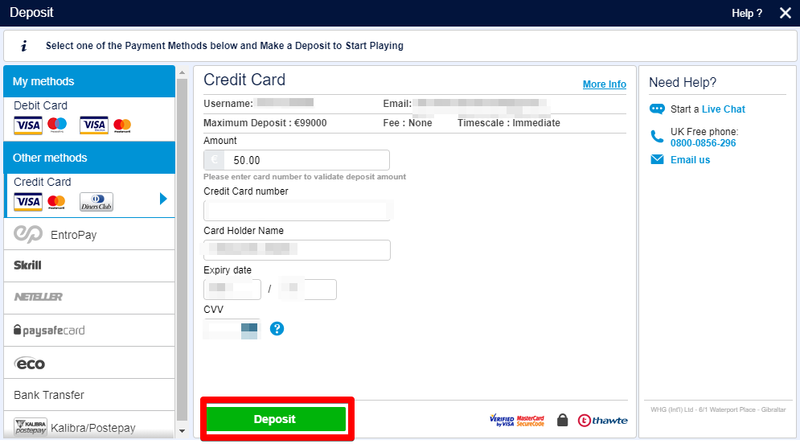 It’s not a coincidence that MasterCard is right on top of the payment methods list on William Hill’s banking page. No matter if you own a debit or credit MasterCard, you will be able to enjoy lightning-fast transactions and great betting experience. 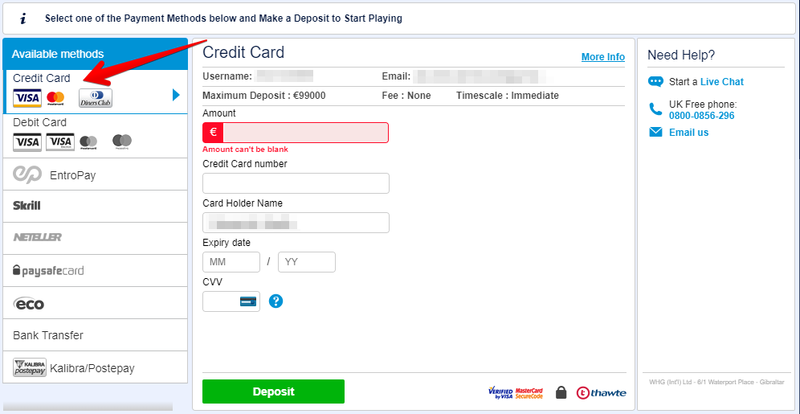 MasterCard is available for both deposits and withdrawals at William Hill, and there are no fees to be worried about. All the deposits made with MasterCard are instant and, thanks to an innovation brought by William Hill, the same goes for withdrawals. 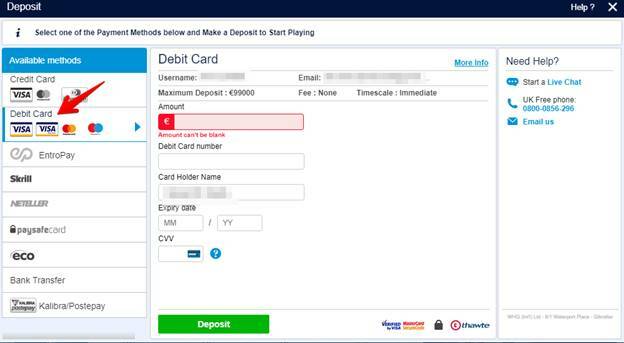 The Priority Access Card they launched in collaboration with MasterCard, William Hill offers their customers instant access to their winnings. That cancels the 3 to 5 business days waiting period that got everyone so annoyed in the past. Also, it marks a very important moment for both the betting site as well as MasterCard. Betfair is another perfect example of how MasterCard and betting sites collaborate to deliver the best possible experience for punters. Being the official betting partner for football clubs such as Barcelona or Arsenal, Betfair doesn’t need any further praise. MasterCard has its reserved spot at the top of the available payment methods list, and it is also a great option for those that enjoy in-play bets. Thanks to the instant processing of the deposit and the short amount of time you spend from the moment you log into your account to when you’re placing bets, MasterCard is excellent as a deposit method. Also, there are no fees that should concern you in any way. Some cards issued by MasterCard in the UK do not have an attached collection account details, making them unusable for withdrawals. Moving on with the list of huge betting sites that promote MasterCard for both deposits and withdrawals, we reach 888Sport. Depositing with MasterCard is facile, and you can get through it in a very short time. 888Sport does not apply any fees on deposits made with MasterCard, and it also processes your transaction instantly for maximum efficiency. It’s recommended to check with their support department before making a deposit, though, to make sure you will be able to use the MasterCard for withdrawals as well. Just like in Betfair’s case, certain cards issued by MasterCard can no longer be used to send money on them so you will most probably have to select a different withdrawal method. One big advantage you get when using MasterCard at online betting sites is instant access to your funds. No matter if you want to buy something online or withdraw cash at an ATM, it’s all possible through MasterCard. Compared to other payment solutions, there is no need for a further transfer of funds like you’d do with Skrill, for example. This advantage is specifically applicable to those punters that already found the perfect betting site for them and are playing at the same sportsbook. After making the first deposit, you get the option of saving the card details so that the next time you deposit, entering only the CVV code and the amount will do it. This means that you’ll be done with the entire process of uploading funds in your betting site account in seconds. Whenever you make a deposit or cash out your winnings with MasterCard, there are no fees that you need to worry about. All the betting sites presented above, as well as all those that are licensed by the UKGC, will not take any fees on your transactions with MasterCard. It may be possible that your bank applies certain fees on the funds you receive, however, that’s a different story altogether. Every payment method has its way of protecting their users from possible threats or cybernetic attacks. The betting sites, in turn, have a different system to ensure a safe and secure betting experience for their customers. MasterCard has its customer protection system called SecureCode that adds another layer of security before the transaction is approved. Right before they process the transaction, you see a new window where you have to input a one-time password sent by the bank, usually through SMS. As you already noticed, there are some types of MasterCard or even entire betting sites where cashing out via MasterCard is not available. That’s one notable downside since it’s very comforting to be able to deposit and cash out using the same method. Sure, you could always go with a different option. However, that means extra checks and effort. If you made at least one withdrawal before, you certainly went through a Know Your Customer procedure. These are standard checks that the regulatory bodies request from betting sites to make sure they know who their customers are. It’s not such a big disadvantage, but it is worth mentioning; when depositing with MasterCard, or any other card, besides the regular ID copy, you will also be asked to send a copy of your card. Again, it’s not that much of a problem. However, you won’t have to do that when depositing with Neteller, for example. Some of you will think this is barely a disadvantage, however, consider the situation in which you just found a great betting site and you want to take advantage of an offer that expires soon. The only problem is that you don’t have your wallet with you and can’t make the deposit without the full details on your MasterCard. While some people can memorise all the 16 digits on a MasterCard, remembering a username and password (as you would do with Skrill) is a lot easier. After you access the account, locate the ‘Deposit’ button and click it. It’s time to enter the SecureCode that is sent by your bank through SMS. Enter the confirmation code and start betting! After seeing all the advantages you get by owning a MasterCard, combined with the way it enhances the betting experience, it is normal to want one for yourself. Depending on what type of card you need, there are several ways of getting one. If you want a debit card signed by MasterCard, then you will have to apply for one at banks in your region. Each bank has its internal procedures when it comes to issuing debit cards. However, the process should be facile. They will most likely require a series of documents such as ID, proof of employment and a financial assessment. Judging by all these documents, they will open an account for you and link a MasterCard to that account. The process of getting a credit card is similar to the one for getting a MasterCard debit. The only comes from the conditions you have to meet to be eligible for a credit card. Also, there are certain other details such as the APR, fees and such stuff that are better to be handled by the issuing bank. 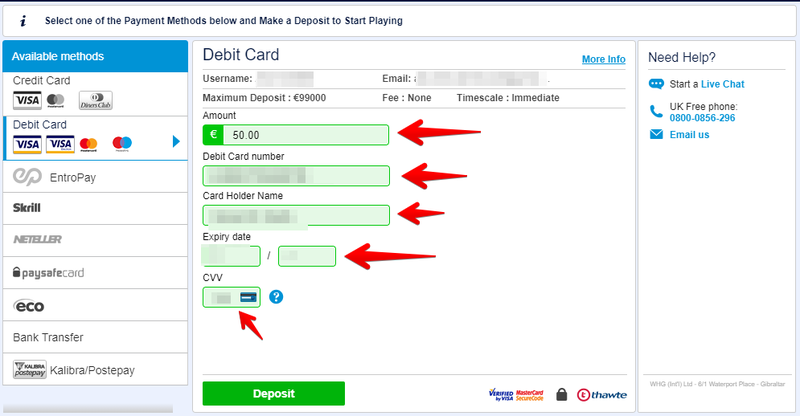 In the applied examples of betting sites that are accepting MasterCard for deposits and withdrawals, you could already get some info regarding fees, limits or withdrawal times. However, this section will clearly emphasise each of these attributes on specific betting sites. This way, you have a clear idea of exactly how efficient a MasterCard is. Keep in mind that no matter which alternative you go with, there are always going to be pros and cons. For example, you can’t use PaySafeCard at all for withdrawals, or PayPal might apply some fees on the funds you receive. Can I use a Pre-Paid MasterCard with PayPal? PayPal allows you to use the pre-paid gift, general and travel cards issued by MasterCard. Some merchants won’t allow purchases with such card. However, they specify that in their policy. You can just as well use a MasterCard debit to fuel your PayPal account with funds. Is MasterCard Widely Accepted in the UK? Not only that MasterCard is accepted in the UK, but you will also find that it is one of the most-used payment options alongside with VISA and PayPal. When it comes to betting sites, these payment methods are top-of-the-list being eligible for both depositing and cashing out your winnings. What’s the Main Difference Between MasterCard and Visa from a Betting Perspective? While both cards have similar mechanisms and offer pretty much the same high-quality betting experience, MasterCard has the disadvantage of not always being suitable for withdrawals. You might spot some minor differences when it comes to fees taken by your bank for one card or another as well. What should you know about MasterCard?